This guide is designed to help you easily find the information you need when it comes to how the City’s waste services work. 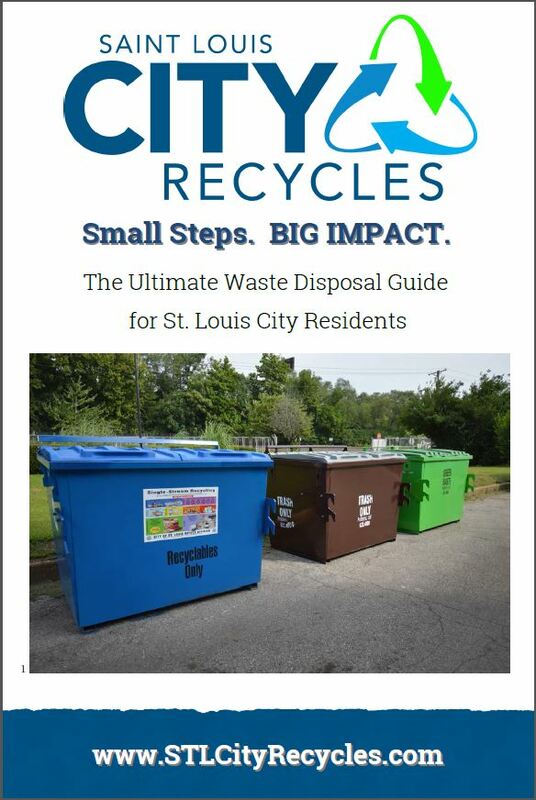 It’s packed with information from recycling and trash to yard waste and bulk pickup and more! Print this guide (two-sided, of course) to keep on hand the details you need about the City’s waste services. We also have “The Ultimate Waste Disposal Guide” printed in booklet form. Feel free to stop by our office to pick up one or enough to share with your neighbors. We are here to give you the tools and knowledge you need to recycle! If you need a quick recycling reference, our Recycling 101 flyer is perfect as a one page handout to keep posted at your home or share with neighbors. All of our printed materials are available in our online toolkit. The information presented is provided in support from the City of St. Louis, Brightside St. Louis, the St. Louis-Jefferson Solid Waste Management District and the Missouri Department of Natural Resources, with photography provided in part by Gwendolyn Mercer Photography. thank you for sending this email. Our household recycles and often have questions about what we can recycle and what we cannot. It would have been most helpful if your “Everything you need to know about recycling” post was formatted so people could print or download the document so we could consult it when we have questions. If you have trouble locating the document, please email us at recycle@stlouis-mo.gov Thanks! This is great. I get so mad seeing electronics, printers, etc. dumped in the bins at Carondelet Park. The new paperwork just lists “plastic bottles & containers” but not any specific info on the plastic number anymore. I feel this is needing a little more information. Could you please elaborate a bit more on that? And, if it means we can now recycle all types/numbers it should probably note that as well since most people are under the impression either #5 or #6 are not recyclable depending where you live. – thanks!! Hi Rebecca! We tried to make the accepted items list as easy as possible to follow. The numbers on plastics simply indicate what type of plastic that item is made from, not if it is recyclable in Saint Louis City’s recycling program necessarily. Nearly all plastic bottles and containers are accepted. Only #6 plastic–which is polystyrene or expanded polystyrene (Styrofoam) and plastic bags and films (despite their number) are NOT accepted. We found an easy rule of thumb to follow is if it’s a plastic container or bottle, recycle it! If it’s Styrofoam, a plastic bag or plastic film, leave it out of your blue bin. Plastic bags and films can be recycled at the grocery store though! Very expressive and easy understandable blog you have shared. I think you are one of them who are very clear about how to express the ideas and views. Thank you for this.